The LTE network is already live in Ottawa and Toronto almost prepared to get connected by September 28th. Rogers has already lined up a few LTE devices including Samsung Galaxy Sil and a couple of others. But it seems they are not satisfied with all these models and now they are targeting HTC Jetstream. It has now even been listed it on their upcoming Rogers on demand tablet application. For those who have not heard about the HTC JetStream it is a 10.1inch model with a dual core Snapdragon processor which provides a speed of 1.5GHz along with Adreno graphics. The screen provides a resolution of about 1280 x 768pixels. It has storage of 32GB and camera of 8megapixels to its rear and 1.3megapixel to its front. 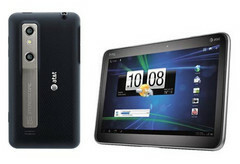 Till now nothing has been reported about the price as well as the date of the release of the particular tablet. While in the US it is priced at $849 by AT&T.